‘I hate the label contemporary-classical’ says Robert Ames, approximately 30 seconds into our interview; ‘It makes no sense’. To be fair, I’m not keen on labels either, so we wriggle through a pleasant chat about collaborations, programming and the phenomenon that is the London Contemporary Orchestra trying not to reference musical genres which might be suggested by the names Xenakis, Jonny Greenwood, Messiaen, Actress, Ed Finnis, Radiohead and Shiva Feshareki. It feels a little bit PC, but testimony to how damn hard it still is today to remove the tags from the music of our time. The LCO was founded in 2008 by Ames and his friend and colleague Hugh Brunt. Co-directors and co-principal conductors, they nailed their colours to the mast straightaway with the name; the London Contemporary Orchestra did what it said on the tin and embraced the breadth of the sonic spectrum that the term ‘contemporary’ suggests. ‘We brought together some great young players and programmed what we loved, what excited us,’ recounts Ames. The early forays were perhaps more in line with what one might expect from a new music orchestra run by two enterprising musicians who trained at the Royal Academy of Music (Ames is also an accomplished violist). They programmed music by Thomas Ades, Mark Anthony Turnage, Emily Hall, Colin Alexander. 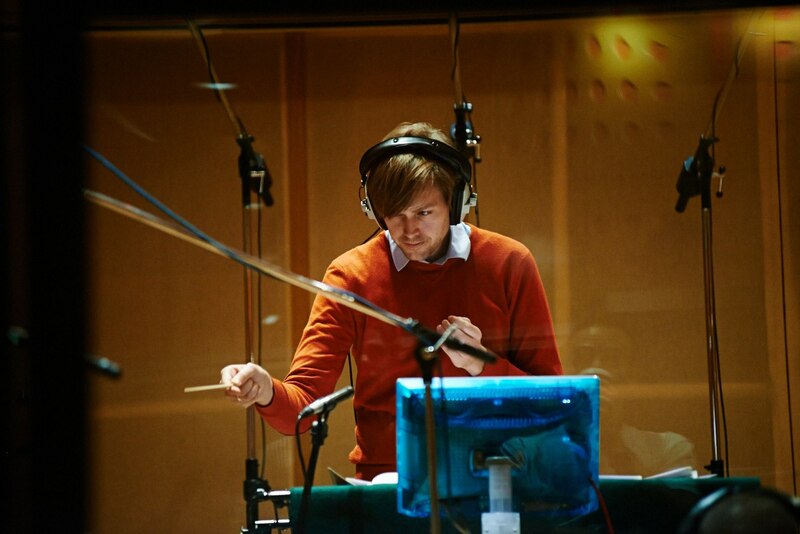 Then a collaboration with Radiohead’s Jonny Greenwood shifted things a little. ‘He creates wonderful music’ says Ames; ‘his string writing is superb’. The collaboration has been a rich and fertile one, driving forwards the LCO’s ambition to perform ‘quality new music….R&B, electronic, rock, pop, hip hop….anything, as long as it has quality’. How do they decide what quality music to programme from such a wide field? Are they driven by what they think audiences might like? ‘Not so much in the selection of the music itself’, Ames says. ‘I think LCO audiences want something fresh, original, an experience.’ Ames is passionate about exploring new venues to create such experiences; LCO events often take place in industrial or utilitarian sites such as Oval Space or the loading bay of the Royal Albert Hall. Ames is rightly proud of their underground excursions into Aldwych and South Kensington Tube stations. They seem to be edging gradually closer to theatrical, site-specific work. In an East London dance venue audiences made their way down a passage to the space and were locked in a darkened room to experience Henri Pousseur. ‘I think we like to challenge our audiences’ Ames reflects. ‘Its liberating. We don’t have rules and we also don’t want to make it too easy for them’. He pauses and adds; ‘But sometimes we just want to create Zen, beautiful experiences with lush harmonies’. Today, there is no shortage of classical music moving out of concert halls and into car parks, dance venues, pubs and utilitarian spaces, where ‘youth’ and ‘collaboration’ are often gateways to diversity, larger audiences and funding sources. But it’s easy to get it wrong and naively releasing a mix of artists and art forms onto a stage is no way to guarantee that the magical synergy will happen. Ames and Brunt have been careful and with a mix of intuition, instinct, trust and ‘keeping our finger on the pulse’ they have engineered collaborations with some of the most highly respected musical artists. Darren J Cunningham (aka Actress) is a stand-out class act in dance music. His sonic world – intelligent, distorted, queasy, melodic, murky – is constantly innovating and looks to the future. Actress is often quoted as admitting to a long term desire to make ‘classical stuff for a modern generation’. What that ‘classical stuff’ may be is perhaps up for grabs, but his motives for working with the LCO are clear enough; both share genre-irrespective attitudes to music and the collaborative process. ‘He’s from a very different place to Jonny Greenwood in terms of musical training,’ says Ames. ‘But there is absolute clarity of intent in the sound. His music is just as refined as anything we programme’. Whilst Actress and Ames have the genre-irrespective attitude down to a tee, I’m struggling a little more to frame my questions in a way that avoids weak simile in lieu of labels. When I catch myself saying ‘Music That Is Like Messiaen or ‘Music That Is Like Actress’ I’m only reminding myself how deeply ingrained it is in our psyche to put things into boxes, no matter how much we would like to consider all new musics equally. But its also difficult to appreciate the success and achievements of LCO without acknowledging some fundamental differences between music genres. To fully admire the savvy, smart and seamless bringing together of these musical types it is perhaps important to be able to distinguish between them in the first place, to apprehend how they can blend in a manipulation of electronic and acoustic sound to become a new hybrid ‘instrument’. Last week I went to a late-night site-specific performance that brought together theatre and dance music in a warehouse. Edgy, bold, well-produced, sophisticated, provocative, utterly memorable. ‘It was a bit like the London Contemporary Orchestra’, said a colleague. That’s a label that Ames should be proud of. The London Contemporary Orchestra performs at the Tanks at Tate Modern on September 6 as part of the BBC PROMS.